There are things that happen around us that automatically trigger a response of anger or stress. We believe our anger or annoyance is justified, and we will often talk with others to validate those feelings. In reality, unless you are being immediately attacked by a killer bear or a steel girder is about to fall on your head, these automatic reactions are neither necessary nor helpful. It is often much simpler than we anticipate to change these patterns and live in happiness despite what is going on around us. There is one simple question we can ask ourselves: do I want to happy? If the answer is yes, then we can be open to looking at things from an alternative perspective. You might think, “well, of course the answer is yes.” But, when most of us honestly examine the way we live, we find that we think, do and say a lot of things that work against our own happiness. Though we may want to be happy, there is often something else that we want more. Perhaps it is something we believe will bring happiness. …not from a change in external conditions: money, physical environment, etc. External conditions can help direct our focus, but dependence or reliance on external conditions as a prerequisite to happiness will always result in disappointment. The material world changes constantly, and we can never control our surroundings entirely, but we can control our perspective. 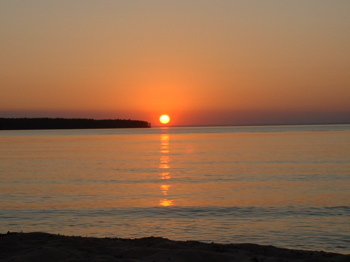 A beautiful sunset over Lake Superior near Cornucopia, WI. The stunning shades of red of the sunset are usually a product of air pollution. I can choose to view this and worry about air pollution, or I can do what I can about air pollution when I can and focus on the beauty of the moment when I watch the sunset. This does not mean that we choose to live in ignorance or ignore problems in the world or in our own lives. Rather, we can change our perspective of them, recognizing that worry and stress do not help us solve any problems. Then, we can use our energy and resources to face challenges rather than worrying about them. Make a commitment to be conscious of your thoughts and recognize when they are automatic reactions that are not helping you. Make clear decisions on actions to take on the things you are unhappy about. If you are completely powerless and there are no actions to take, make a decision to let it go. Plan to deal with problems when the time is right. For instance, if you are lying in bed worrying about something, decide on a specific, appropriate time when you can deal with it. Obviously, there is nothing you can do about most things when you are lying in bed. Be patient with yourself. Realize that habits take time to change. When I started to change the way I look at my struggle with time management, I would often find myself stressed out and frustrated for a long time before catching myself and changing my perspective. But, I kept doing it and reminding myself that I want to be happy no matter what happens. Today, I still get frustrated but usually catch myself in the middle of the thought and am able to turn it around. Peter at I will change your life . com posted The Think Different Challenge, and I have been tagged by Jean at Stress To Power . com in her post, Living More Fully, to join the challenge with a post. This post is my contribution and my challenge to you to think different. Check out Peter’s Post for a list of participating posts, and read what others have written about thinking different. Thanks for participating in the challenge. You have written an excellent article I can really identify with. As someone who has gone from being depressed 5 years ago to now loving life, I agree that happiness is an internal journey that has little to do with external conditions. I have added your article to my list. Thanks for the post. It sums things up nicely. I believe consciousness is the key. Far too many people rush through life never considering that the present moment “is” their life. We want to either remember what happened yesterday or strive for tomorrow, never realizing that now is the big “it”. Thanks for your article, Danny.